Cliff Arnebeck: "King Lincoln Election Fraud Case Alive and Well in Columbus, Ohio"
You recently published on your web site a press release from Paddy Shaffer containing various assertions against counsel for the plaintiffs in the King Lincoln case. Paddy's group apparently felt this might be helpful to their effort to persuade the US District Court to change its decision denying their motion to intervene in our case. We responded to those assertions in court. However, for the information of your readers, our effort continues to be to fully expose the ongoing fraudulent manipulation of our nation's elections. To succeed in this we need the help, not only of our election reform community, but also our nation's investigative press corps and law enforcement agencies--particularly at the national level. The fraud and cover up of the 2004 election was national in scope, and directed by Karl Rove out of the offices of the White House. 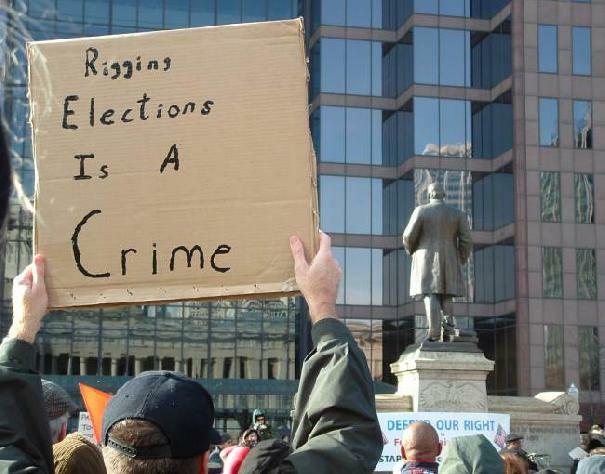 Citizens' group Ohio Election Justice Campaign (OEJC) calls on media to investigate collapse of Ohio's landmark 2004 election fraud lawsuit; deadline for prosecution for destruction of evidence expires soon. Columbus, OH (PRWEB) June 15, 2009 -- As the deadline for prosecution of election officials looms, Brunner's office has taken no action to investigate the 2004 election or the destruction of key evidence in the landmark 2004 Ohio election fraud lawsuit, King-Lincoln v. Blackwell, 2:06-cv-00745 (S.D. Ohio), according to the Ohio Election Justice Campaign (OEJC). In a May 2009 blog, Ohio Secretary of State Jennifer Brunner admitted, "Numerous election activists have reviewed the centrally stored ballots in great detail, some with conclusions that allege wrongdoing." Brunner live blog on May 16, 2009 (Link). The deadline for prosecution for the destruction of key evidence in the election fraud case will expire in the next few weeks. As alleged in court documents, a private corporation, The Ohio Association of Election Officials, encouraged the destruction of evidence in violation of federal court order. Motion for Special Grand Jury (pdf). This group will be holding its summer conference June 15-17th, 2009 in Columbus at the Columbus Renaissance Hotel. SOS Brunner is hosting this conference, entitled "Election Officials Summer Conference and Trade Show." In Ohio's current tight budget, the SOS office will not give costs for conference hosting. The OEJC, a citizens' group, believes the problematic history of activities among Brunner, local officials, and the attorneys for the plaintiffs indicate a concerted effort to a) avoid a speedy trial against the State, b) destroy evidence, and c) protect the officials that committed the wrongdoing. Members of OEJC say for over two years, the press, including the progressive media, has virtually avoided this aspect of the story. Curiously, media outlets that broke the story of the stolen 2004 election have been silent on the collapse of the election fraud lawsuit. One of these outlets, the Columbus Free Press, is controlled by an attorney in this case. OEJC also believes the attorneys, including lawyer/lobbyist Clifford O. Arnebeck, Jr., who for years claimed to be protecting the records, are failing to take steps to prevent ongoing destruction of evidence. OEJC member Mark Brown said, "At best, Arnebeck and his associates are providing useful distractions to cover up the wide net of perpetrators. If the Ohio election were investigated, it could pull down the legitimacy of the United States for those four years of the stolen presidential term. Just as with our banking crisis, the media will not pay attention until it is too late." For more information, visit "Resolve It or Relive It: A Summary of Ohio's Unresolved 2004 Election Fraud Lawsuit". Brunner promised a fair and open elections program if elected. She was tested early. When a federal judge ordered the collection of 2004 presidential ballots from Ohio County election boards, 58 of 88 failed to return some to all of their ballots. This was a prime time opportunity for Brunner to open up an investigation into the sorry state of Ohio elections. What did she do? She offered this statement shortly after hearing of the lost ballots. "If I had evidence of a cover-up, I would investigate," Brunner said. "For me, the bigger question in 2004 was, 'How many people were prevented from voting,' (something) you can't quantify." Brunner was never asked to explain how she could have any "evidence" without an investigation.